well, we have done it again. another year distinguished by lazy Gulf-side living, the gathering of dear loved ones and general silliness. we were a bit curious about what Oklaloosa Island would offer this year, given the severity of damage reported after last year's hurricane season. 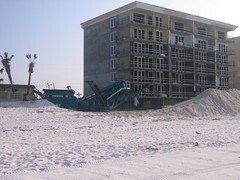 many of the condos were closed, one had been razed, and several were in varying stages of repair. our old standby sustained minimal damage above the ground floor, thanks to hurricane shutters installed after the last big storm season. the unit we stayed in was on the top floor with a glorious view of the gulf and all it had to offer. the weather was unexpectedly spectacular with clear skies, moderate heat and restrained humidity. for the first time in since i have started going to the beach, we had green flags all day every day. 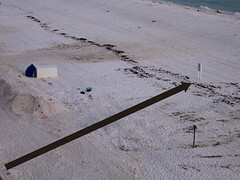 the most striking difference from previous years was the decimation of the beach and dunes (black arrows). during our visit, crews made remarkable progress reconstructing the dunes using shop brooms, wheelbarrows, and Bobcats. unfortunately, even with relocation of the sand and aggressive limitation of human disturbance, it will still take many years for the dunes to regrow. 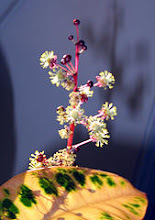 i did note with delight the first shoots of neonatal sea oats emerging from the sand, like new blades of grass, tender and fine. 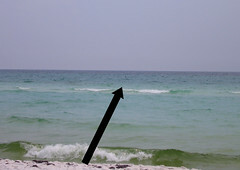 the loss of beach was somehow more striking as the distance from condo to Gulf was only 2/3 of what it once had been. unlike the dunes, this loss is probably more permanent. even with dredging the bay, there is no good way to rebuild the ocean edge. i suspect over time as more hurricanes have their way, the island will disappear, the bay will become land and all the condos will crumble. in the meantime, one arguable upside is the greater ability to spot dolphins from the condo balcony. the first two nights there was light rain and thunder while i was out walking the beach. it is a fairly short walk from our location to beach deep in the shorefront occupied by the Air Force base. the night is untouched there as no development is allowed on the base. a peculiar and complete peace fills me when i sit in that dark, the lull of waves and coolness of the rain washing over my senses. an experience to savor. there are so many reflections and stories to share, but this seems a good place to sign off my first report on life at the beach.